This weekend there was snow in Maryland. Snow. Before November 1st. Wowzers. And I was of course out in the mess and yuck since I was out taking pictures for the Gift Guide. I was so exhausted after the yucky conditions and commuting that I was a complete vegetable all day yesterday and all I mustered up was enough energy to do laundry (that I hadn’t done for 2 weeks) and to knit a small project I’ve been wanting to try. If you follow my Boards on Pinterest, you may remember me pinning this project a long time ago. I had really just gotten into knitting and I thought the idea of a braided knit necklace was just adorable but I had to figure out how I could do it myself. And I did! 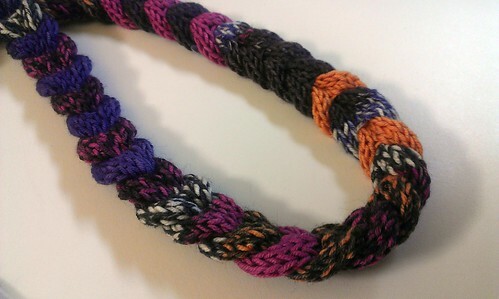 I was so proud of myself, it took me a while but I figured it out after reading several different patterns and I created my own braided necklace with a very fun yarn that changes colors and has all kinds of patterns. It’s not a typical braid, more like strands woven into each other but I still like it a lot. I even created a loop and sewed on a knit covered button for a clasp! I was so proud of myself on this one. Next time I’ll make it longer so I can just slip it over my head and maybe if it’s nice enough I’ll even give one away. I knitted a lot on my shrug today!!! I love this necklace. It’s made with 3 i-cords, isn’t it? Actually, no. I read about i-cords but didn’t feel like learning something new (lazy, yes). This is 2 strips and they have holes in them about every inch (I knit 2 together after I do a yarn over) and then you just pull the top strip through the next hole and keep alternating. So I only had to knit 2 strips, pretty easy! I love this. Can you please post instructions? How funny! I just blogged using my pins from Pinterest and mentioned you in the post!